A rare stand of eastern hemlock trees (Tsuga candanensis) extends along the steep bluff over Back Creek at this 43-acre preserve in eastern Lawrence County. The native hemlock stand is one of only a few dozen in Indiana, and had long been a target for preservation. The property was secured by a conservation buyer when it suddenly came up for auction. 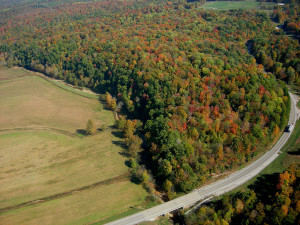 Sycamore then repurchased it at cost in 2010 with funding from the Laura Hare Charitable Trust and the Indiana Heritage Trust through the Department of Natural Resources’ Division of Nature Preserves. In recognition of the property’s statewide significance, it has been dedicated as a Indiana State Nature Preserve by the DNR. In addition to the hemlocks, other rare plants found at the preserve include the state-threatened purple flowering raspberry (Rubus odoratus) and goatsbeard (Aruncus dioicus). Back Creek, a significant perennial stream, flows along the property’s west boundary. The preserve is named in honor of the late Dr. Laura Hare, whose foundation contributed a majority of the purchase price of the land. There is currently no trail or parking at the preserve, due to limited sight lines along the highway.